My husband grew up in a family where chores were expected. He is patient, wise and hardworking. Am I saying that we are a reliable case study, thereby proving that children who are taught to do age appropriate chores turn out to be more responsible? with a good work ethic? and ruggedly handsome? Yes, yes I am. 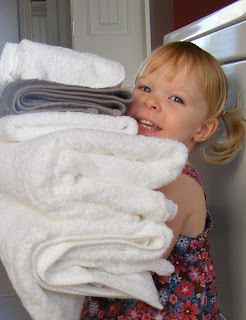 Here is a list of seven chores that my daughters, ages 4 and 2-and-a-half, are expected to do. 1) Make their bed. Every morning. I don't expect perfection, but their sheets need to be pulled up and their pillows and dolls and stuffed animals all need to be piled on neatly. 2) Pick up their toys. I have baskets on a shelf in the living room in which their toys are stored. There is a separate shelf for books. If your going to expect your toddler to be able to put their toys away, keep it simple. 3) Put their dirty clothes in the hamper. I need to remind them. Often. But that is part of training our children. You can either tell them a billion times when they are four or you can tell them ten billion times when they are fourteen. 4) Set the table. Start by having them lay out serviettes for each family member and move up from there. My kids fight over who gets to set the table. 5) Sort laundry. Kids love this. 6) Put their own laundry away. This is by far my favorite. I don't even fold the clothes. I just make a pile of laundry for each child and then hand it to them. They fold it and put it away. They adore this chore. My four year old is very careful to fold things nicely and stack things carefully in the right drawer. My younger daughter is a little less precise, but most of her clothes end up in the right drawers. 7) Wipe up their own spills. I keep a bunch of bar-mop towels in a drawer in the kitchen. If the kids spill their juice, they know that they are expected to get a towel and clean it up. You have to actually teach them to do the chores. Don't just tell them to go make their bed and expect them to know what that means. Be a good example. Your children will be much more apt to make their beds if they've seen mommy make her bed! Don't expect perfection. After all, they are just kids! Do expect them to do their best. Teach your children to take their responsibilities seriously. Don't be tempted to do everything for your kids just because you can do it faster and better. Your priority is to train up your child, not to have a perfectly ordered sock drawer. So, tell me....what have i missed? Great advice...my 5 year old, Porter, loves to help with chores and if you are not picky, then hopefully they will still like doing them even when they are older. Porter is cleaning up more now, even without me asking, because of his 8 month old brother...he doesn't want him to get a toy or garbage in his mouth that he could choke on. I like that you keep it simple and have shelves and drawers that they can reach...I love the look on a child's face when they can do it themselves. I do have to work harder on being a good example for my child, but luckily as I teach him, he is also teaching me. I look forward to reading more of your blog. With love, Cheryl. Awesome post!! This is something I really need to work on. My daughter is pretty good at picking up her toys...when we tell her to. And we definitely aren't consistent. Thanks for posting this...it has encouraged me to work on it. My kids aren't going to know what hit them tomorrow morning! lol. My 4 year old also feeds and waters the dog. He loves it! He also helps me sweep. I have a little mini broom with the dustpan attached, and he just goes to town with it. :-) Thanks for these other ideas! My kids help put away some dishes. Their plasticware that they use for meals is stored in a drawer they can reach, they put pots and pans in the bottom of the stove and tupperware is in a lower cupboard for easy accessibility. They also clear their dishes after meals and put what food they haven't eaten in the bag for composting. I let them start sweeping the floor with a hand broom and dust pan. Even at 2 they can begin to take responsibility for messes they make. They may not clean it perfectly, but they are learning and will improve over time. Just this evening my son (6) said to me it wasn't fair that he couldn't do the dishes. I get in the habit of wanting to just get it done, but tonight I said, "you are right. Mom will let you have the privilege of doing the dishes." And there were a lot, and he loved every minute of it and didn't complain. The sense of pride he had when he was done was a beautiful thing to see. I need to remember that children also like the rewarding feeling of a job well done. Great post. My 3 oldest children (10, 8, 8) rotate dishes. #1 starts by washing all the bowls. #2 dries and puts them away, then washes the plates. #3 dries and puts away the plates, then washes all the cups and silverware, which #1 dries and puts away. And they take turns on who gets to wash what. Mommy (me) does the pots and pans, and my youngest (6.. not quite adept at REALLY getting the dishes clean) has become the "worlds greatest cleaner of tabletops and cabinets". Last one done eating sweeps the floor after dinner. They are also responsible for keeping their bathroom clean and organized, and this does include the cleaning of the toilet (generally done by my 10yr old girl or my 8yr old boy), as well as their rooms, and folding and putting away their own laundry and generally help wherever I ask. I started having my daughter help clean her messes since she could sit up! She was only about 14 mos when she would grab a napkin off the table and start 'cleaning' the condensation. She is almost 2 and cleans her own room and stacks the clean dishes after dinner and throws away trash without me asking. She is hurt if I don't include her in my chores! It does take longer and more effort to include a one year old in my chores, but I've learned that its easier than chores AND keeping an eye on her :) I am grateful to the Lord for teaching me that training children isn't something that is done on accident! So happy to see Mom's who believe in teaching their children to work! We live in a day where that is being lost. A responsible child is a responsible adult. Yes, it IS easier and faster to do it ourselves sometimes, but that's not the point! Love your style and outlook. It's a blessing to all of us! I do love haring from Moms like you! This is awesome! I have to say I am one of those moms who can do it quicker myself and I need to work on my patience. We have started a chore chart to teach the kids responsibility and also working and earning. We give them a small amount of money for each completed chore during the week. They then have to divide their pay into savings, giving and spending. Because I use a 4:1 solution of water and vinegar for most of my cleaning, I can safely allow my 5-1/2 and 2-1/2 year old sons to clean just about anything. Yes, I expect the 5 y/o to clean his own bathroom. No, it isn't perfect, and vinegar isn't the strongest disinfectant in the world, but it's better than having to do it ALL myself. And when they meet my future daughters-in-law, their bathrooms won't be so nasty that she's afraid to use the toilet. I really enjoyed these little tidbits! I'm almost giddy reading them. I too grew up doing chores, but struggle not to just do everything for my daughter, thanks for the tips!